Scientists Just Analyzed Dozens of Natural Disasters. Can You Guess Which Ones Humans Made Worse? California's epic wildfire season has our fingerprints all over it. Climate scientists are pretty good at figuring out the causes of long-term trends. We know that dumping greenhouse gases into the atmosphere will make global temperatures rise over time. But pinning down the cause of any single weather event—a specific heat wave, hurricane, or drought—is much more challenging, since extreme things could still happen without global warming. That's why scientists are so reluctant to say that any particular event happened "because of" climate change. Nevertheless, there is a rapidly growing field of research that is attempting to improve this kind of one-off attribution. On Thursday, the National Oceanic and Atmospheric Administration released a dossier of 29 such studies, combing through some of 2014's worst weather events across the globe to search for the fingerprints of man-made climate change. The scientists, who represent a range of prominent research institutions, looked at California's wildfire season; heat waves in Australia; drought in East Africa; flooding in Indonesia; hurricanes in Hawaii; and more. Their findings were as diverse as the events they examined, and they still tend to be framed as "Event X was made more likely because of climate change," rather than the simpler but less accurate "Event X was caused by climate change." Some events, such as Hawaii's hurricanes, appear to have a strong relationship to man-made global warming. Others, such as extreme rainfall in the United Kingdom last winter, showed no link at all. Over the last few years, as California has sunk deeper into an unprecedented drought, the wildfire season has essentially never ended. 2014 was bad; 2015 is worse; and the only good news is that this year's strong El Niño could mean a wet winter and thus a less-bad fire season in 2016. The link between climate change and fire is pretty straightforward: Snowpack melts earlier, summers are hotter and drier, and boom, more fires. And sure enough, that appears to be what is happening in California. In this study, scientists at the Pacific Northwest National Laboratory used a combination of field observations and satellite data to quantify fires in California going back a few decades. They were interested not just in the size or number of actual fires, but a metric called "fire risk" that combines data on temperature, precipitation, and other factors. Then they combined the fire risk data with a computer model that assumes greenhouse gas emissions stay relatively high into the future. Unsurprisingly, the risk of fire shoots up over time. 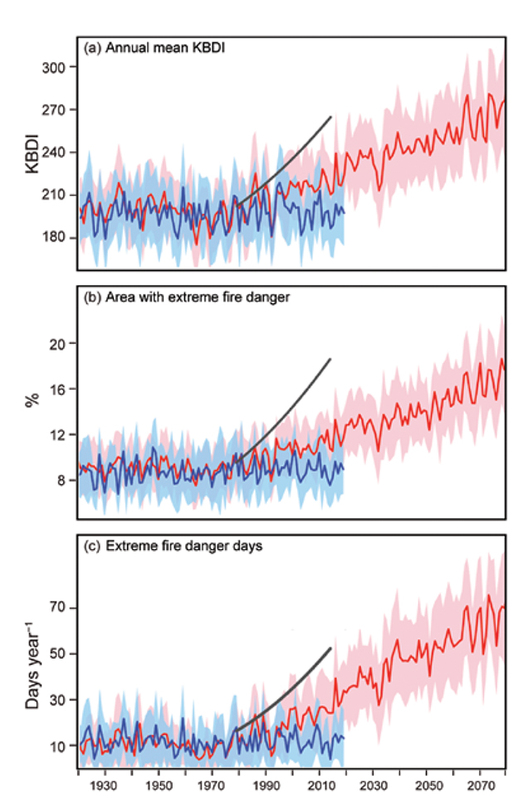 In the charts below, from the study, the blue line shows year-to-year fire variability with the effects of climate change removed from the model. The red line uses the same fire data, but with the climate data put back in. In other words, the gap between the blue line and the red line is the effect of man-made global warming (KBDI is the fire risk index). You'll notice that 2014 lands on a spot where the blue and red lines overlap. According to lead author Jin-Ho Yoon, "that means that according to this model, 2014['s fire season] could have happened without human activities at all. It's possible to have such an event." "But if we step back from this single event," he said, "that's relatively easier to say that the fire risk is increasing and easily attributable to climate change." There's nothing climate change deniers like Donald Trump and Sen. James Inhofe(R-Okla.) love more than a nice snowfall or cold winter to use as proof positive that global warming is a hoax engineered by China and Barbra Streisand. They got their chance a couple winters ago, when temperatures in the Great Lakes region between November 2013 to April 2014 were the lowest they'd been in decades. But of course, one cold winter doesn't prove or disprove anything. Again, scientists are looking for trends. 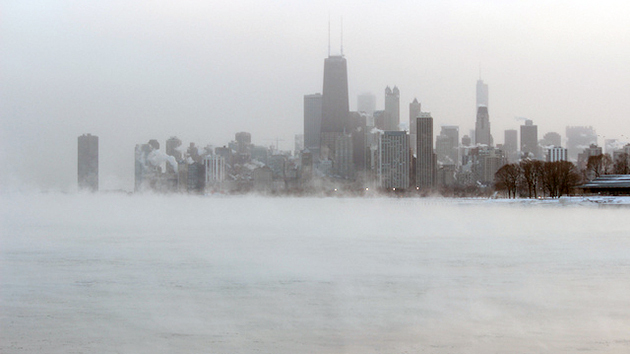 And when climatologists from the University of Colorado looked back at the temperature record over the last 134 years, they found that the frigid Midwestern winter was incredibly rare, thanks to man-made climate change. "While a winter comparable to 2013/14 would have been roughly a once-a-decade event in 1881...it has become roughly a once-in-a-thousand years event in 2014," the study found. That change in probability is due to long-term increases in temperature. That's probably good news for Midwesterners, as that extreme wintry weather caused billions of dollars in economic losses. Drought in the Middle East is a matter of vital concern to US national security, since the failure of crops can enflame pre-existing political tensions and contribute to violent conflict. This has already happened in Syria. Some research also exists linking Syria's unprecedented drought to climate change, and that conclusion is generally supported by a couple studies in the NOAA report. One study, focusing on Syria, combined observed rainfall data and climate modeling to show that the country's lack of precipitation during the 2013-2014 rainy season was made about 45 percent more likely by climate change. Another study, looking more broadly at the Mediterranean and Middle East, found that at least one of the major drivers of drought in the region—sea surface temperatures in the western Pacific—was definitely amplified by global warming. Two other drivers, central Pacific sea surface temperatures and atmospheric conditions in the North Atlantic, did not appear to be influenced by climate change. A third study focused on the Horn of Africa, which includes parts of countries such as Kenya and Somalia that also face high food insecurity and political instability. The rainy season that should have arrived in late 2013 was virtually nonexistent, leading to drought in early 2014 and widespread crops failures. That study failed to find a connection between climate change and the lack of rainfall, but it did blame global warming for higher temperatures and increased solar radiation that made the effects of the drought worse. Studies like this will get better over time, Yoon said, as scientists get more practice and better data-gathering tools. Ultimately, the goal is to provide a real-time answer to the question of "Did this happen because of climate change?" Searching for the causes of particular events also helps scientists understand, and therefore predict, what types of events are likely to occur more or less often in the future. Then, hopefully, we take steps to prepare for them.